ESPN Plus (commonly referred to as ESPN+), is an over the top (OTT) service available to residents in the USA. ESPN+ provides original or exclusive content to ESPN+ and cannot be accessed via ESPN linear. Subscribers can access a selection of live games from various sports such as MLS, MLB and NHL during theregular season. Other sporting events available on ESPN+ include Boxing, UFC (starting in 2019), as well as Grand Slam tennis events such as Wimbledon, US Open and the Australian Open. From a Soccer point of view, ESPN+ subscribers will have access to the Italian Serie A, EFL and the UEFA Nations Cup. Beyond soccer, suscribers will have access to a rich offering of top sports broadcasting including: FIBA basketball, CFL football, cricket and rugby including World Rugby Sevens, European Champions Rugby; College Sports including college football, basketball, lacrosse and softball. This service also provides access to exclusive archive content from ESPN, including documentaries from the network. Furthermore, this service grants access to premium content on espn.com and WatchESPN. ESPN+ subscribers are not served display ads, pre-roll and post-roll video ads anywhere on the ESPN App, ESPN.com and connected TV devices. 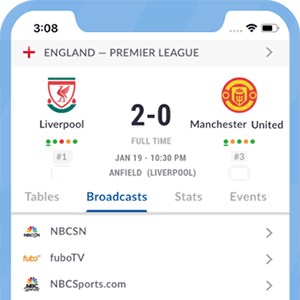 Users can go directly to ESPN+ video highlights. *Got itLive Soccer TV does not provide ESPN+ live streaming. The information provided on this page is simply ESPN+ soccer TV schedule.